In time of daffodils evolved in its own particular way. The starting point was a commission from Jeremy Huw Williams to write a short song cycle for voice and piano. Flowers have inspired many poets and there are, in particular, a number of beautiful poems about daffodils. This was a strong enough impulse to pursue the idea but it was also helpful to have such a clear and consistent theme and the obvious associations with Spring (when the first performance was to be given) and with Wales, further encouraged this approach. Having chosen To daffodils by Herrick, To an early daffodil by Lowell and the famous Wordsworth poem, I was ready to set to work. In a further move towards symmetry, I then made specific structural decisions about the tonalities of the settings. The Housman is diatonic to A minor and the Lowell to D major. The central Wordsworth setting contains stanzas in these two tonalities alternating with its own tonality (diatonic to B minor/D flat major). The second sequence of poems follows the same tonal scheme. The aim of this whole approach was to represent in music both the familiarity of the turning/returning year and the different feelings and circumstances that we may encounter at those same times. I also wished to touch on the theme of death and renewal. All lovely tales that we have heard or read! The title of the piece is drawn from the first line of a poem by ee cummings (not set). 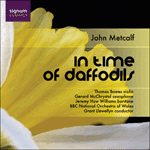 The first three songs of In time of daffodils were commissioned by Jeremy Huw Williams with funds made available by the Arts Council of Wales and the National Lottery. The subsequent reworking into a symphonic cycle of six songs with a short orchestral interlude was in response to a commission from BBC Radio 3. The orchestration of the work features prominent roles for solo woodwinds—to reflect the pastoral quality of the piece—and for brass and harp (for their visual association with daffodils). No 7: To an early daffodil Thou yellow trumpeter of laggard Spring!